This page describes how to enable interactive access to an instance's serial console to debug boot and networking issues, troubleshoot malfunctioning instances, interact with the GRand Unified Bootloader (GRUB), and perform other troubleshooting tasks. A virtual machine instance has four virtual serial ports. Interacting with a serial port is similar to using a terminal window, in that input and output is entirely in text mode and there is no graphical interface or mouse support. The instance's operating system, BIOS, and other system-level entities often write output to the serial ports, and can accept input such as commands or answers to prompts. Typically, these system-level entities use the first serial port (port 1) and serial port 1 is often referred to as the serial console. If you only need to view serial port output without issuing any commands to the serial console, you can call the getSerialPortOutput method or use Stackdriver to read information that your instance has written to its serial port; see Viewing serial port logs. However, if you run into problems accessing your instance through SSH or need to troubleshoot an instance that is not fully booted, you can enable interactive access to the serial console, which lets you connect to and interact with any of your instance's serial ports. For example, you can directly run commands and respond to prompts in the serial port. Enable interactive serial console access for individual VM instances or for an entire project. Caution: The interactive serial console does not support IP-based access restrictions such as IP whitelists. If you enable the interactive serial console on an instance, clients can attempt to connect to that instance from any IP address. Anybody can connect to that instance if they know the correct SSH key, username, project ID, zone, and instance name. Use firewall rules to control access to your network and specific ports. Enabling interactive serial console access on a project enables access for all VM instances that are part of that project. By default, interactive serial port access is disabled. You can explicitly disable it by setting the serial-port-enable key to 0 instead of 1. In either case, any per-instance setting will override the project-level setting or the default setting. Go to the Metadata page. Click Edit to edit metadata entries. Add a new entry with the key serial-port-enable and value 1. Enable interactive serial console access for a specific instance. A per-instance setting, if it exists, will override any project-level setting. You can also disable access for a specific instance, even if access is enabled on the project level, by setting serial-port-enable to 0, instead of 1. Similarly, you can enable access for one or more instances even if it is disabled for the project, explicitly or by default. Click the instance you want to enable access for. Under the Remote access section, toggle the Enable connecting to serial ports checkbox. After enabling interactive access for an instance's serial console, you can connect to the serial console using the Google Cloud Platform Console, the gcloud command-line tool, or a third-party SSH client. The serial console authenticates users with SSH keys. Specifically, you must add your public SSH key to the project or instance metadata, and store your private key on the local machine from which you want to connect. The gcloud tool and the Google Cloud Platform Console will automatically add SSH keys to the project for you. If you are using a third-party client, you might need to add SSH keys manually. Click the instance you want to connect to. Under Remote access, click Connect to serial console to connect on the default port (port 1). If you want to connect to another serial port, click the down arrow next to the Connect to serial console button and change the port number accordingly. For Windows instances, pull down the dropdown menu next to the button and connect to Port 2 to access the serial console. where [INSTANCE_NAME] is the name of the instance for which you want to access the serial console. To connect to any other port, provide a different port number using the --port flag. You can provide a port number from 1 through 4, inclusively. To learn more about port numbers, see Understanding serial port numbering. Note: You must have added your public key to the project or instance metadata before you can use a third-party SSH client. If you have used the gcloud tool in the past to connect to other instances in the same project, your PUBLIC_KEY_FILE is likely located at $HOME/.ssh/google_compute_engine.pub. If you have never connected to an instance in this project before (so have never added public keys), you will need to add your SSH keys to the project or instance metadata before you can connect using a third-party SSH client. See Adding and Removing SSH Keys for more information. You can connect to an instance's serial console using other third-party SSH clients, as long as the client allows you to connect to TCP port 9600. [PROJECT_ID] is the project ID for this instance. [ZONE] is zone of the instance. [INSTANCE_NAME] is the name of the instance. [USERNAME] is the username you are using to connect to your instance. Typically, this is the username on your local machine. [OPTIONS] are additional options you can specify for this connection. For example, you can specify a certain serial port and specify any of the advanced options below. The port number can be 1 through 4, inclusively. To learn more about port numbers, see Understanding serial port numbering. If omitted, you will connect to serial port 1. If you are having trouble connecting using a third-party SSH client, you can run gcloud compute connect-to-serial-port with the --dry-run command-line option to see the SSH command that it would have run on your behalf, and compare the options with the command you are using. Download Google's Serial Port server SSH key. Open your known hosts file, generally located at ~/.ssh/known_hosts. For security reasons, Google may occasionally change the Google Serial Port server SSH key. If your client fails to authenticate the server key, immediately abort the connection attempt and follow the directions above to download a new Google Serial Port server SSH key. If, after updating the host key, you continue to receive a host authentication error from your client, stop attempts to connect to the serial port and contact Google support. Do not provide any credentials over a connection where host authentication has failed. Type ~. (tilde, followed by a period). The CTRL+ALT+DELETE key combination or other similar combinations. This will not work because the serial console does not recognize PC keyboard combinations. The exit or logout command does not work because the guest is not aware of any network or modem connections. Using this command causes the console to close and then reopen again, and you remain connected to the session. If you would like to enable exit and logout commands for your session, you can enable it by setting the on-dtr-low option. If you are trying to troubleshoot an issue with an instance that has booted completely, or trying to troubleshoot an issue that occurs after the instance has booted past single user mode, you might be prompted for login information when trying to access the serial console. By default, Google-supplied system images are not configured to allow password-based logins for local users. If your instance is running an image that is preconfigured with serial port logins, you need to set up a local password on the virtual machine instance so you can login to the serial console, if prompted. Note: This step is not required if you are interacting with the system during or prior to boot or with some serial-port-based service that does not require a password. This step is also not required if you have configured getty to log in automatically without a password using the "-a root" flag. The following instructions describe how to set up a local password for a user on a virtual machine instance so that the user can log on to the serial console of that instance using the specified password. On the instance, create a local password with the following command. This sets a password for the user that you are currently logged in as. Follow the prompts to create a password. Next, log out of the instance and connect to the serial console. Enter in your login information when prompted. Login prompts are enabled on port 1 by default on most Linux operating systems. However, port 1 can often be overwhelmed by logging data and other information being printed to the port. Alternatively, you can choose to enable a login prompt on another port instead, such as port 2 (ttyS1), by executing one of the following commands on your instance. You can see a list of available ports for an instance in Understanding serial port numbering. The following table lists images preconfigured with a serial console login and the default ports. To enable login prompts on additional serial ports, use the following instructions. Note: The instructions below are divided between operating systems running systemd, upstart, or sysvinit. For all sets of the instructions, you can replace ttyS1 with another serial port if desired. sudo sh -c "sed -e s/ttyS0/ttyS1/g < /etc/init/ttyS0.conf > /etc/init/ttyS1.conf"
Note: Ubuntu 12.04 does not have a ttyS0.conf, so Google recommends that you copy the ttysS0.conf file from Ubuntu 14.04 and use it on the instance running Ubuntu 12.04.
sudo sh -c "sed -ne '/^# # ttyS0/,/^# exec/p'  < /etc/init/serial.conf  | sed -e 's/ttyS0/ttyS1/g' -e 's/^# *//' > /etc/init/ttyS1.conf"
Each virtual machine instance has four serial ports. For consistency with the getSerialPortOutput API, each port is numbered 1 through 4. Linux and other similar systems number their serial ports 0 through 3. For example, on many operating system images, the corresponding devices are /dev/ttyS0 through /dev/ttyS3. Windows refers to serial ports as COM1 through COM4. To connect to what Windows considers COM3 and Linux considers ttyS2, you would specify port 3. Use the table below to help you figure out which port you want to connect to. Note that many Linux images use port 1 (/dev/ttyS0) for logging messages from the kernel and system programs. The Magic SysRq key feature allows you to perform low-level tasks regardless of the system's state. For example, you can sync filesystems, reboot the instance, kill processes, unmount filesystems and so on, using the Magic SysRq key feature. Type ~B (tilde, followed by uppercase B). Type the desired Magic SysRq command. Note: The Magic SysRq key is normally implemented using PC keyboard scan codes but there is no direct equivalent on a serial port. This is the recommended method of accessing the Magic SysRq feature. Compute Engine provides audit logs to track who has connected and disconnected from an instance's serial console. To view logs, you must have permissions for the Logs Viewer or be a project viewer or editor. 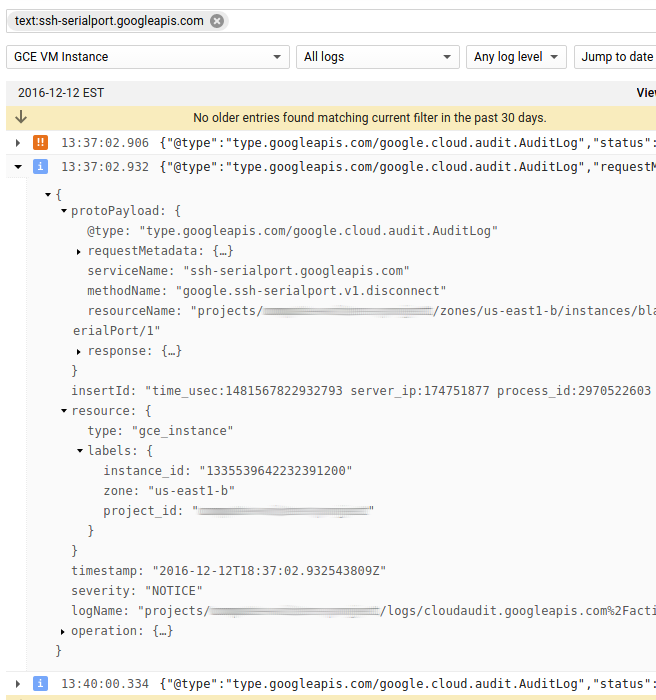 Go to the Logs page in the GCP Console. Expand the drop-down menu and select GCE VM Instance. In the search bar, type ssh-serialport.googleapis.com and hit Enter. Look for methodName to see activity this log applies to (either a connection or disconnection request). For example, if this log tracks a disconnection from the serial console, the method name would say "google.ssh-serialport.v1.disconnect". Similarly, a connection log would say "google.ssh-serialport.v1.connect". An audit log entry is recorded at the beginning and end of each session on the serial console. There are different audit log properties for different log types. For example, audit logs relating to connections will have some properties that are specific to connection logs, while audit logs for disconnections will have their own set of properties. There are certain audit log properties that are also shared between both log types. requestMetadata.callerIp The IP address and port number from which the connection originated. resourceName A string containing the project ID, zone, instance name, and serial port number to indicate which serial console this pertains to. For example, projects/myproject/zones/us-east1-a/instances/example-instance/SerialPort/2 is port number 2, also known as COM2 or /dev/ttyS1, for the instance example-instance. resource.labels Properties identifying the instance ID, zone, and project ID. timestamp A timestamp indicating when the session began or ended. operation.id A ID string uniquely identifying the session; you can use this to associate a Disconnect entry with the corresponding Connection entry. request.serialConsoleOptions Any options that were specified with the request, including the serial port number. request.username The username specified for this request. This is used to select the public key to match. status.code For successful connection requests, a status.code value of google.rpc.Code.OK indicates that the operation completed successfully without any errors. Since the enum value for this property is 0, the status.code property will not be displayed in this case. However, any code that checks for a status.code value of google.rpc.Code.OK will work as expected. response.duration The amount of time the session lasted, in seconds. When a connection fails, Compute Engine creates an audit log entry. A failed connection log looks very similar to a successful connection entry, but has the following properties to indicate a failed connection. google.rpc.Code.INVALID_ARGUMENT: The connection failed because the client provided an invalid port number or tried to reach an unknown channel. See the list of valid port numbers. google.rpc.Code.PERMISSION_DENIED: You have not enabled interactive serial console in the metadata server. For more information, see Enabling interactive access on the serial console. google.rpcCode.UNAUTHENTICATED: No SSH keys found or no matching SSH key found for this instance. Check that you are authenticated to the VM instance. google.rpc.Code.UNKNOWN: There was an unknown error with your request. You can reach out to Google on the gce-discussion group or file a bug report. status.message The human-readable message for this entry. You can disable interactive serial console access by changing metadata on the specific instance or project, or by setting an Organization Policy that disables interactive serial console access to all VM instances for one or more projects that are part of the organization. This is a Beta release of Organization Policies. This feature is not covered by any SLA or deprecation policy and might be subject to backward-incompatible changes. If you have been granted the orgpolicy.policyAdmin role on the organization, you can set an organization policy that prevents interactive access to the serial console, regardless of the whether interactive serial console access is enabled on the metadata server. Once set, the policy effectively overrides the serial-port-enable metadata key and no users of the organization or project can enable interactive serial console access. By default, this constraint is set to false. Follow the instructions below on how to set this policy on the organization. After setting up a policy, you can grant exemptions on a per-project basis. where [ORGANIZATION_ID] is the numerical organization ID. For example, 1759840282.
where [ORGANIZATION_NAME] is the organization name. For example, organizations/1759840282. The policy is immediately effective so any projects under the organization will stop allowing interactive access to the serial console. You can set the same organizational policy on a per-project basis. This overrides the setting at the organization level. where [PROJECT_ID] project ID for this request, such asmy-example-project. You can turn on enforcement of this policy by using the enable-enforce command with the same values. where [PROJECT_NAME] is the project ID. If you are having trouble connecting using a standard SSH client, but gcloud compute connect-to-serial-port connects successfully, it might be helpful to run gcloud compute connect-to-serial-port with the --dry-run command-line option to see the SSH command that it would have run on your behalf, and compare the options with the command you are using. Setting the bit rate, also known as baud rate: You can set any bit rate you like, such as stty 9600, but the feature normally forces the effective rate to 115200 bps (~11.5kB/sec). This is because many OS images default to slow bit rates such as 9600 on the serial console, and would boot slowly. Some OS images have inconvenient defaults on the serial port. For instance, on CentOS 7 stty icrnl is required to tell the console to do the right thing with the Enter key (which sends a CR, aka ^M). The bash shell might mask this until you try to set a password, and then wonder why it seems stuck at the password: prompt. Some OS images have job control keys that are disabled by default if you attach a shell to a port in certain ways. Some examples of these keys include ^Z and ^C. The setsid command may fix this. Otherwise, if you see a job control is disabled in this shell message, be careful not to run commands that you will need to interrupt. You might find it helpful to tell the system the size of the window you’re using, so that bash and editors can manage it properly. Otherwise, you might experience odd display behavior as bash or editors attempt to manipulate the display based on incorrect assumptions about the number of rows and columns available. Use the stty rows Y cols X command and stty -a to see what the setting is. For example: stty rows 60 cols 120 (if your window is 120 chars by 60 lines). If you connect using SSH from machine A to machine B, and then to machine C (and so on), creating a nested SSH session, and you want to use ~ commands such as to disconnect, or send a serial break signal, you will need to add enough extra ~ characters to the command to get to the right SSH client. A command following a single ~ will be interpreted by the SSH client on machine A; two consecutive ~ (ENTER~~) will be interpreted by the client on machine B, and so forth. You only need to press ENTER once, because that is passed all the way through to the innermost SSH destination. This is true for any use of SSH clients which provide the ~ escape feature. If you lose track of how many ~ characters you need, press the ENTER key and then type ~ characters one at a time until the instance echoes the ~ back. This indicates that you have reached the end of the chain and you now know that to send a ~ command to the most nested SSH client, you need one less ~ than the number you typed. replay-lines=N: Set N to the number of lines you want replayed. For example, if N was 50, then the last 50 lines of the console output is included. replay-bytes=N: Replays the most recent N bytes. You can also set N to new which replays all output that has not yet been sent to any client. replay-from=N: Replays output starting from an absolute byte index that you provide. You can get the current byte index of serial console output by making a getSerialPortOutput request. If you set replay-from, all other replay options are ignored. Replay lines up to, but not more than, the number of lines or bytes described by these flags, whichever is less. This option will not replay more than N or M bytes. The most recent 1 MiB of output for each serial port is always available and generally, your SSH client should not miss any output from the serial port. If, for some reason, your SSH client stops accepting output for a period of time but does not disconnect, and more than 1 MiB of new data is produced, your SSH client might miss some output. In these scenarios, when your SSH client is not accepting data fast enough to keep up with the output on the serial console port, you can set the on-dropped-output property to determine how the console behaves. insert-stderr-note: Insert a note on the SSH client's stderr indicating that output was dropped. This is the default option. ignore: Silently drops output and does nothing. You can enable disconnecting on exit or logout commands by setting the on-dtr-low property to disconnect when you connect to the serial console. Enabling this option might cause your instance to disconnect one or more times when you are rebooting the instance, as the operating system resets the serial ports while booting up. Note: With some operating systems, this setting will have no effect on serial port 1. However, it should work on ports 2-4 for most operating systems, and on port 1 for some systems. The default setting for this option is none, where nothing happens when the DTR line changes. If you change this to none, you can reboot your instance without being disconnected from the serial console but the console will not disconnect through normal means such as exit or logout commands, or normal key combinations like Ctrl+d. Learn more about the getSerialPortOutput API. Learn how to retain and view serial port output in Stackdriver even after a VM instance is deleted. Learn more about applying metadata.